This seems like a twin brother to Royston Tan's Little Note, though the latter is of course made by a more seasoned pair of hands and eyes. 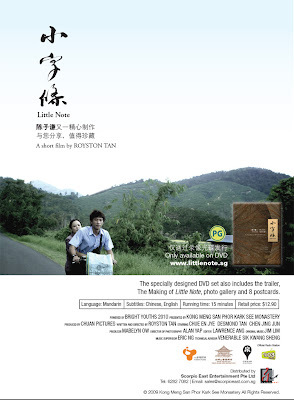 Similar to Royston's film, it tells about a son who is leaving the kampung (village) to further his studies and face the world and though the son does not bring much, he brings her spirit along in his heart. One big difference between the two films is that the lady in 'Letting Go' is a closer physical epitomy of the mother role that the one in 'Little Note'. She has such a disarming and benevolent look that I really had something to take home with that film, even though you feel you have seen this story in a dozen other manifestations. Found this link somewhere on facebook... Enjoy!